Info "Show the audience what you got!" Mall Tour is one of Kat and Ana's microgames in WarioWare: Smooth Moves. "The Samurai" form must be used when playing this game. 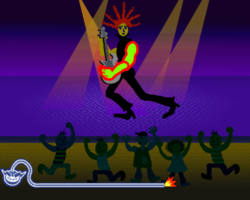 The objective of this microgame is to strum the character's guitar to make the audience move upwards on stage. The difficulty depends on how many people are in the crowd. Once each audience member is on the stage, the player will win the microgame. Failing to do this on time, however, will make the microgame end in a loss. 1st level difficulty: There are few people in the crowd. 2nd level difficulty: The number of people in the audience is increased. 3rd level difficulty: Many people are in the audience. This page was last edited on February 19, 2018, at 18:32.